At the New England Museum Association’s annual conference in November, we shared some images of recent acquisitions. 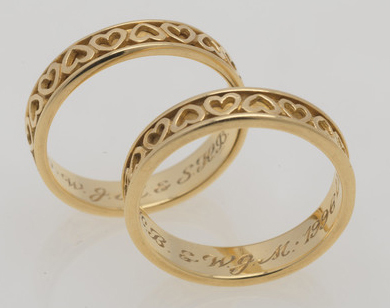 These engraved rings piqued everyone’s curiosity. They represent just one of the many personal stories visitors will discover in the upcoming exhibition Mementos: Jewelry of Life and Love from Historic New England, set to debut at the Eustis Estate in Milton, Massachusetts. Stephen Borkowski and his partner Wilfrid J. Michaud Jr. fell in love with these romantic gold bands in the front window of Tiffany’s while vacationing in Florida. Once they returned to Boston they made a trip to Copley Place, where they had Tiffany’s customize each band with their initials and the dates of their decade of life together. Upon Wilfrid’s death in 2002 Stephen added another engraving, “UBLUD,” which stands for united by love until death, inspired by the classic 1968 film Mayerling. The couple was never able to officially marry as Massachusetts did not pass a marriage equality law until May 2004. Stephen donated the pair of rings in their original boxes to Historic New England in Wilfrid’s honor in 2015. Explore Historic New England’s jewelry collection.